Tallinn… I have to admit, I did not know much about the capital of Estonia before visiting it. Ok, ok, I knew it is a tiny country near Russia close to Saint Petersburg. I also knew that Estonia is the most digitally developed country in Europe… or in the World? . What does that even mean!? Well, you can vote and pay taxes online (yaay! ), receive an e-citizenship (more on that here) etc. Right, I also knew that they produce Vana Talllinn, a great liquor, you have to try it! Shame on me, that’s about it; not that much, huh? Bow to you if you knew more about Estonia! FUN FACT: My mom told me Estonia was the first foreign country I have ever visited: she visited Tallinn while being pregnant with me :). Naturally, I always cherished some nice feelings towards the country and was anxious for the opportunity of going there to arise! I was in Saint Petersburg for a friend’s wedding and had some extra time left. Tallinn is so close, that I could not miss the chance! I bought a (very inexpensive) bus ticket and in 6 hours I was already in the Old Town of Tallinn. While the city has only 400 000 inhabitants (not that much for a capital), it has countless points of interest! I ended up staying for almost a week, thus, I had the chance to discover and compare what is worth doing and visiting and what is not. Are you ready?! Let’s begin now! Tallinn’s old town is just marvelous! I walked around there for days shuffling down cobblestone paths on Tallinn’s narrow streets, staring at medieval cathedrals and sunny squares full of people. 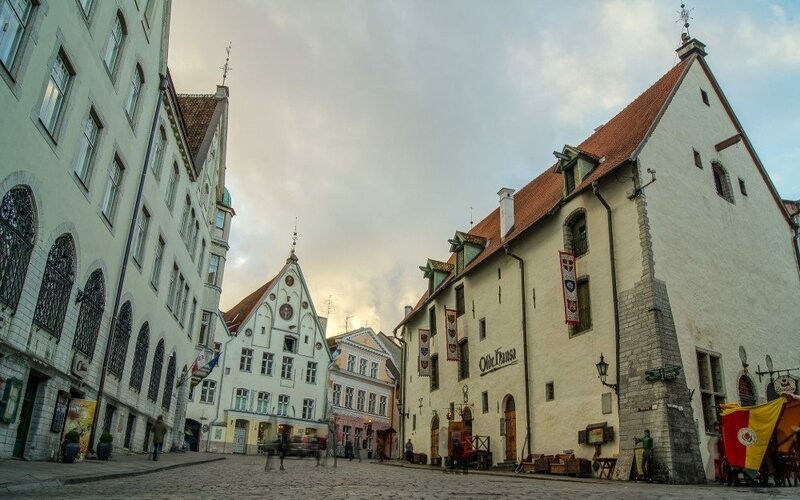 Though the city was quite bombed during the WW2, Tallinn’s old town is astonishingly well preserved. It was built between the 15th and 17th centuries and for this reason it is inscribed on the UNESCO World Heritage list! You don’t really need a map nor an itinerary to discover it. Just going by foot everywhere and stumbling on interesting things is fulfilling enough. Go eat some local food in one of the countless restaurants, stroll the narrow streets checking the cute stores around. When walking around the Old Town do not miss Raekoja Plats, Toompea Hill, Viru Gate and Raekoda (Town Hall). After walking around those pretty streets of the Old city, you would like to take a look at those pointy spires and red-tiled turrets from above, wouldn’t you? The best place to do so is St. Olaf’s Church (Oleviste kirik). You can see the view to the whole city from there, absolutely stunning! Be prepared to climb some stairs, at the end, it is worth the view! NOTE: It might be better to go to the tower of St Olaf’s church right after the opening (10 a.m.). There is only one spiral staircase to go up and people obviously need to go both directions, up and down. Thus, if you are visiting in the middle of the day, you will have to often stop and let people who go down pass. “No way, seriously, she want me to go to a history museum?” – you might think. 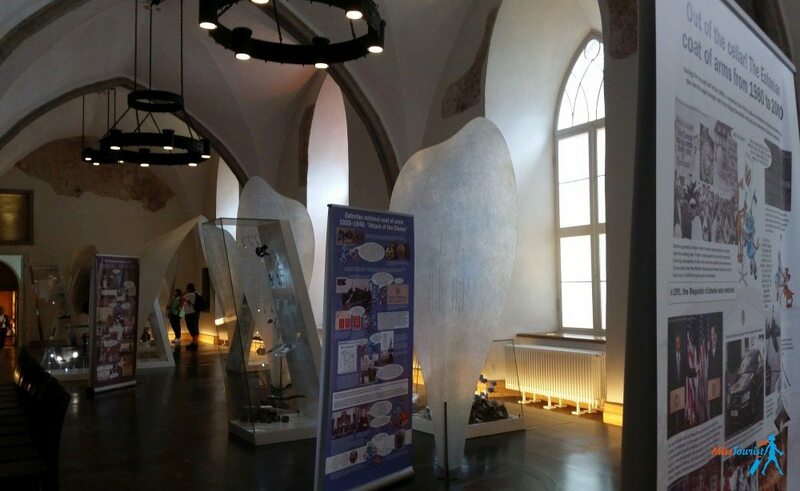 Trust me on this one, the Museum of the History of Estonia is not as boring as it sounds! 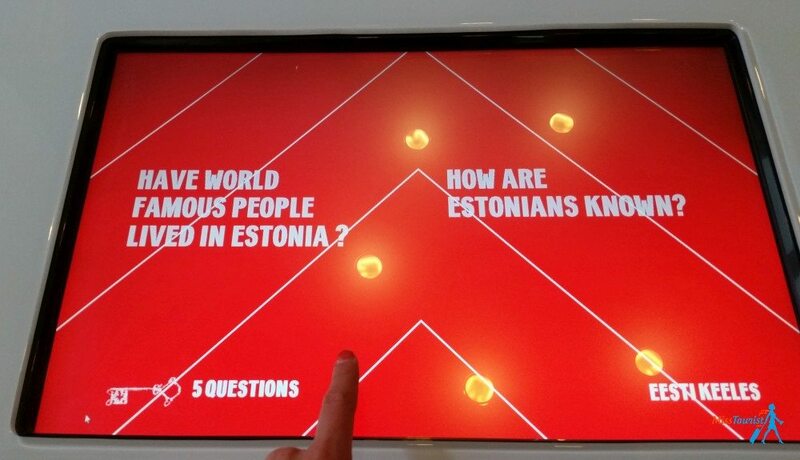 On the contrary, the Museum of History of Estonia is one of the most interactive museum I have been to. They really did make a great job making the museum as engaging as possible. You can touch and play with some displayed items while learning cool stuff about the national history (something that I really appreciate! ), not only stare at text. Do go there, it is interesting and fun. I have spent at least a couple of hours in the museum alone. NOTE: Every last Thursday of the month the entrance to the museum is free. Estonia was ruled by the Russian emperor Peter the Great from 1710. 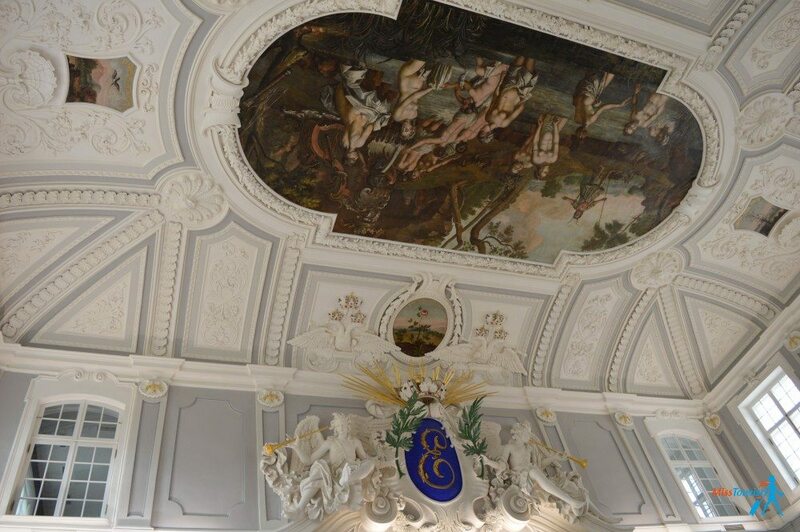 He has built a beautiful palace for his wife Catherine in Tallinn (ok, actually the one he has built for himself in Petergof, Russia is way more beautiful, you absolutely have to visit it!). Nevertheless, the park is nice to walk around and the palace itself is worth checking out too! There is also the KUMU Art Museum in the park. While I am not that much into contemporary art, I did not go, but I have heard it is interesting. You can check it out at least from the outside, the building is very special. Last, but definitely not least, you should check out the Seaplane Harbour museum! As Tallinn is an important port city, as I mentioned above, it has A LOT to show you about its fleet. Even if I am a typical girl in this sense and am not interested in boats and submarines, this museum is absolutely amazing, because it lets you see and touch things as they were before! No boring texts included! 🙂 Definitely one of the best marine museums in the world! 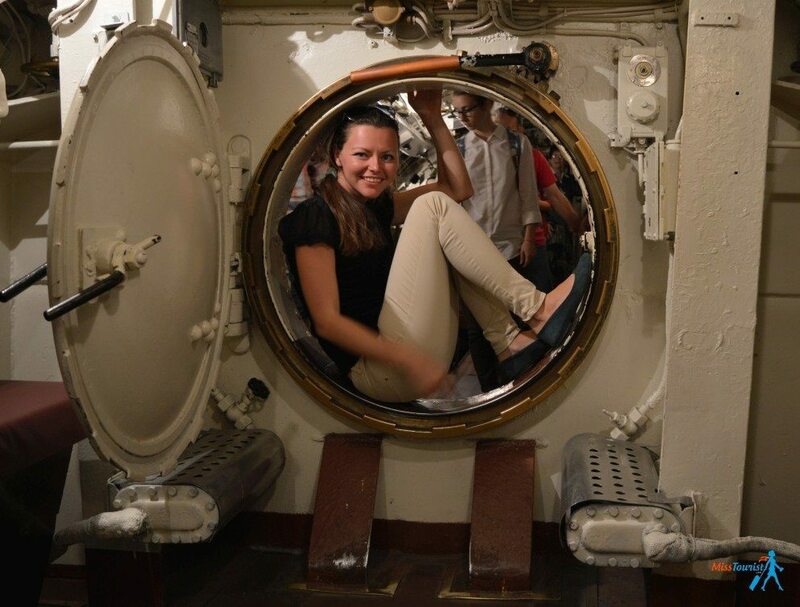 Did you ever have a chance to crawl through a huge 600-ton ones working submarine from 1936? See how the crew member sleep, cook, eat. How the engine and the torpedo rooms looks like? And how tiny and narrow everything is? Guess what, you totally can do it in the Seaplane Harbor museum! It was used during the war time and it had 30 people as the crew. It is right in the middle of the museum exposition and it is so huge, you won’t miss it! 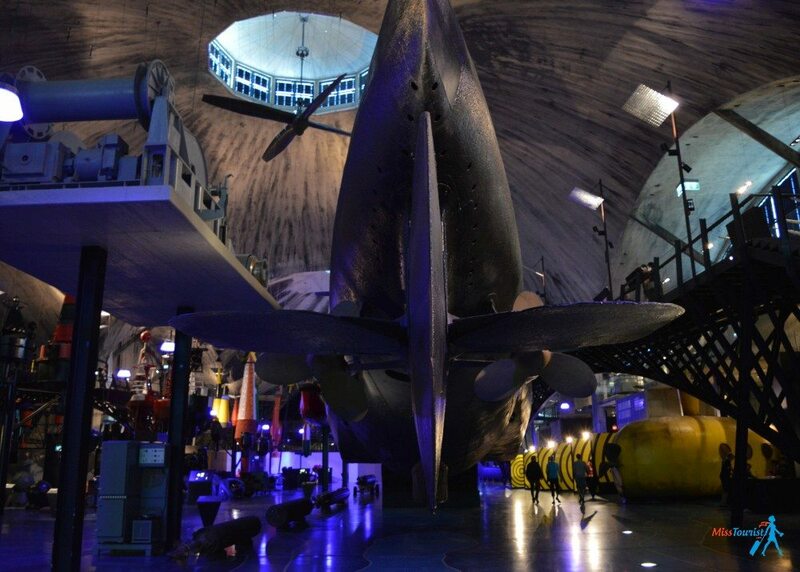 Except the jewel of the museum, the submarine, you will see the history of boats in a nutshell. You will get to know everything about boat style starting atthe wooden simple fisherman boats and eskimo-style canoes used in icy waters to some modern big ships. Don’t forget to go outside of the museum to the seafront (just 50 meters away) and walk inside the real boats, it is included it your ticket! You will be able to see the rooms of different crew members class (from high ranking officers to janitors), go down to the engine floor (incredibly big) etc. In fact, some of the boats are operating boats, so there is a dispatcher, ready to leave at any moment. 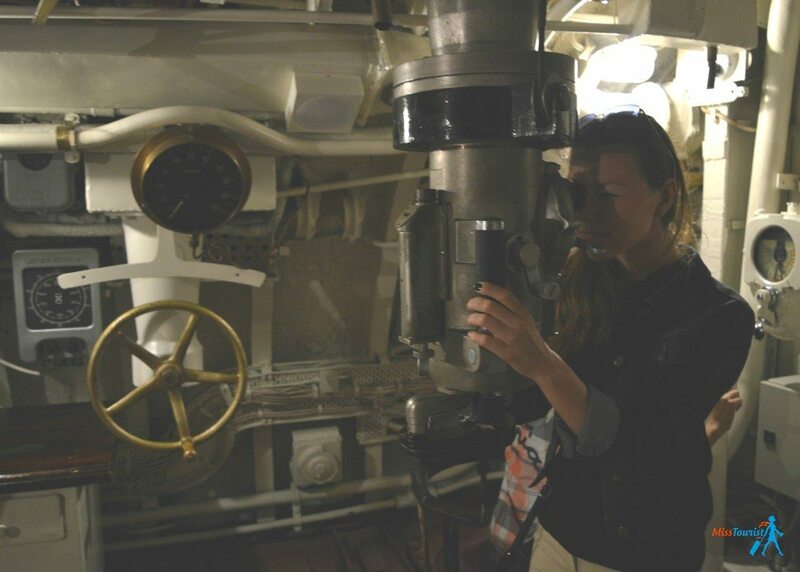 NOTE: Take the free guided tour when you go to the marine museum, it is also included in your ticket. While I cannot find information about it on their official website, it exists, believe me! You can ask your hotel to call them and ask about the precise time of the tour. There are a couple a tours a day in Estonian, Russian and English. I really recommend taking that one, it is quite short, about half an hour, but it gives a great general overview about the museum. ENTRANCE: 14 EUR – adults, 8 EUR – students. Combined ticket (Seaplane Harbour museum and Maritime museum) – 16 EUR . You can use your ticket the next day as well. NOTE2: You can buy a combined ticket for 2 museums, but, honestly, I didn’t like the second one too much, it is nothing special compared to the first one, but you can learn about the city’s fortifications and have a nice view from Fat Margaret tower. 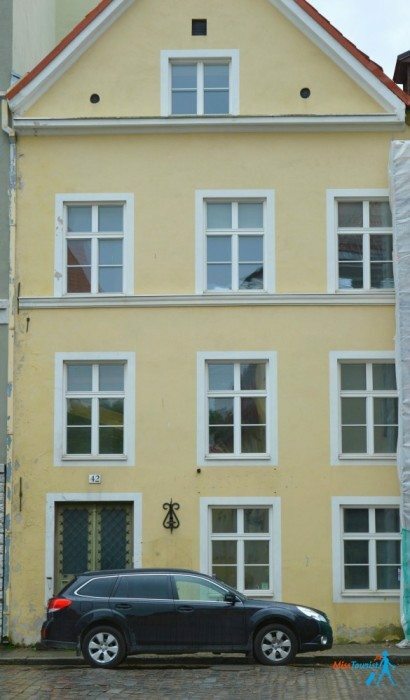 Where to stay in Tallinn? Thinking about where to stay in Tallinn? There is one hotel, which is so unique, and I can promise you, you will never forget the experience of staying there! 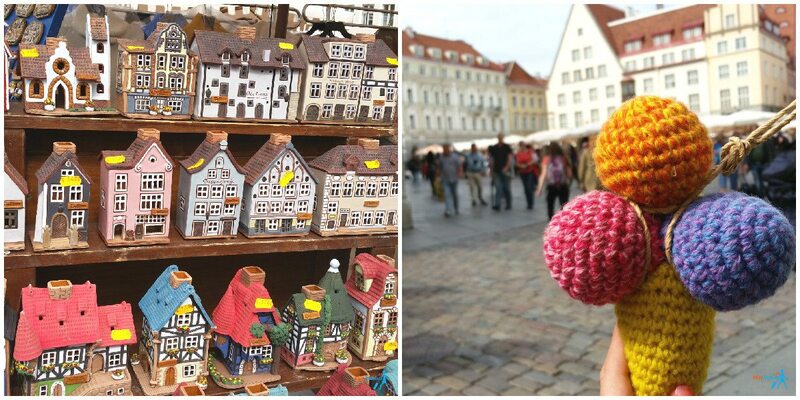 Walking around the city and checking out its souvenirs shops, you will see a model of 3 narrow colorful buildings closely attached to each other on many magnets, pates etc. Why is that? What makes this place called “The three sisters” so special that people even put it on their fridge? While the whole Old town is protected by UNESCO, the “Three sisters” is a UNESCO World Heritage building itself! Can you imagine yourself staying, living, and having your breakfast in a UNESCO World Heritage? The place was not always a hotel, obviously. They were originally 3 spectacular merchant houses built in 1362. 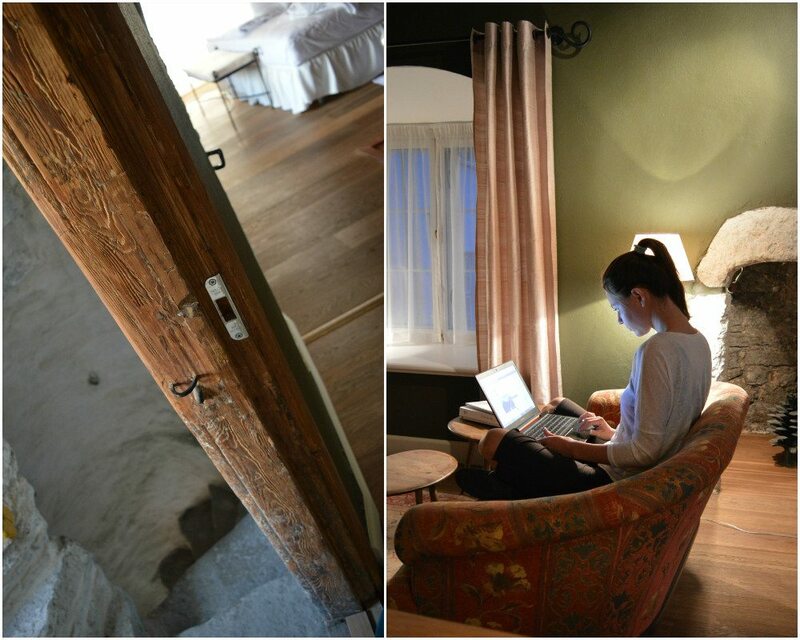 Just recently, the place was renovated, the houses were united to create this perfect trendy hotel! The Three Sisters is located in the heart of Old town, just a few steps away from the Town Hall and all the sights can easily be explored on foot from there. My local friends visited me in the hotel for a drink, and they said it looks even better in the real life than on the video. And I totally agree! Already after I recorded this video, I have noticed that I have a door which I didn’t know where it would lead. I opened it and what did I see? A preserved medieval staircase that led to my neighbors’ room one floor down. How awesome is that? My own private secret passage! It was so great looking out from my window, I could see tourists taking pictures of the hotel. The excursions would stop once in a while to tell people the history of the place. 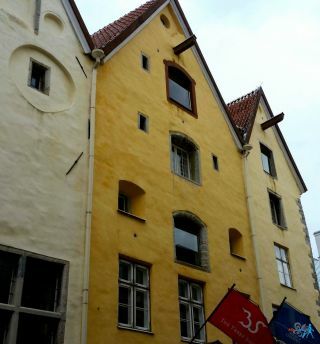 The Three sisters hotel offers you a chance to gaze old Tallinn city’s wall cracks but still with style, comfort and luxury! Each of the 23 rooms is unique in décor, shape and size, but each offers up-to-date comfort with a retrospect to medieval history. 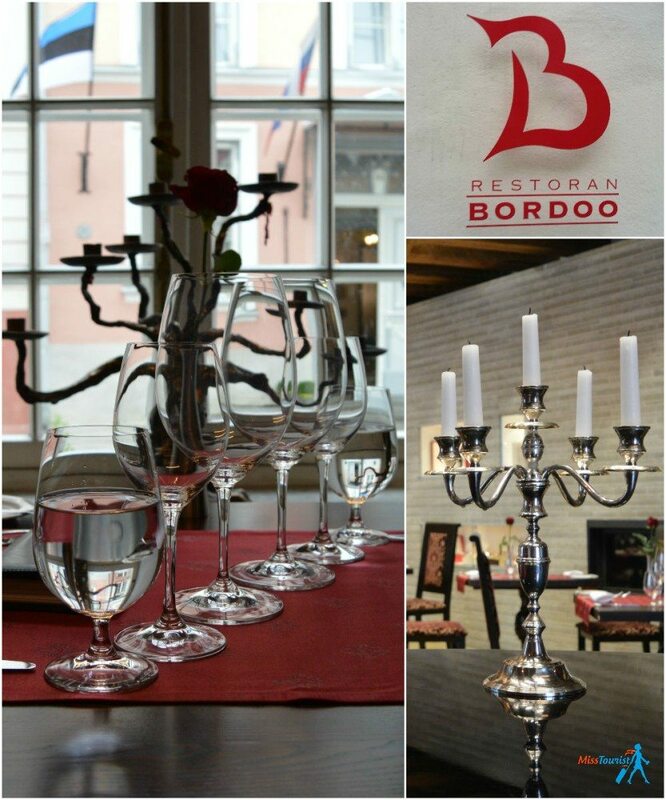 Make sure to visit their restaurant called Bordoo (you can of course just walk in as well, you don’t have to be a guest of the hotel to dine there), it is located on the ground floor of the hotel. Bordoo surprised me with high quality European food as well as very affordable prices for its level. 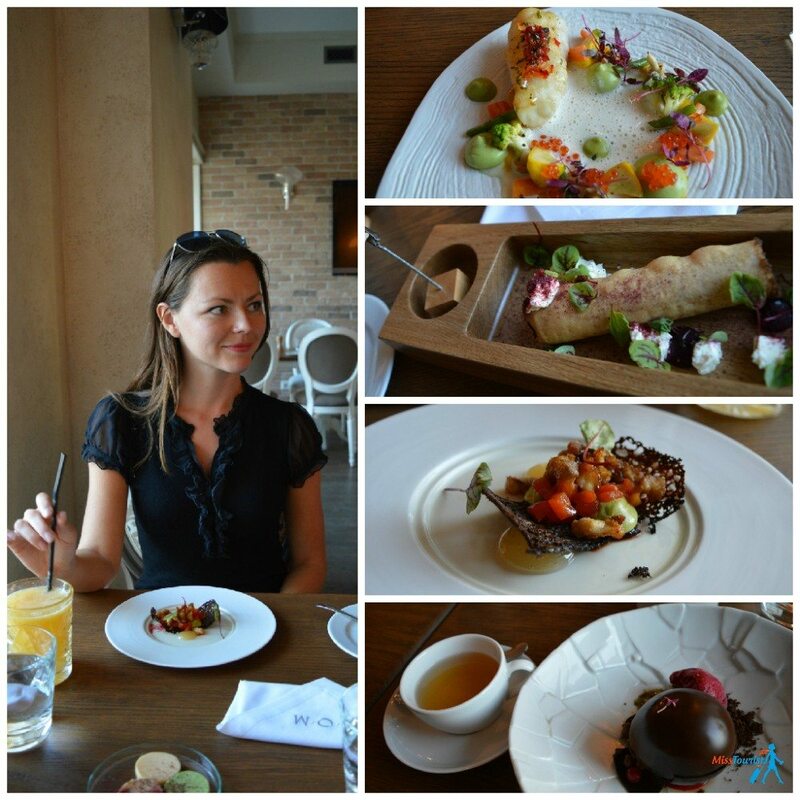 The food was so delicious, I am getting hungry just by thinking about it! By the way, every Friday there is live piano music, great for romantic dinners! I was nicely taken care of by the very professional and friendly front desk of the hotel. When I arrived at 7 a.m. (hence, much earlier than the check-in time), they made sure I have my room ready as soon as possible! When I was going out of the hotel in the pouring rain thinking where to buy an umbrella, it was noticed right away and I was offered a branded umbrella that all guests of the hotel can use! How nice! I really enjoyed those little details that make a hotel a truly enjoyable to stay place. If you have a chance, pamper yourself by staying there, that is one of those special hotels where you will not only receive a five star luxury for your money, but also the experience, the feel of history and discovery of one-of-its-kind building. I stayed in the Three Sisters for 3 nights and could not have been happier with my experience! PRICE: while the most luxurious suite with a unique piano taken the last minute can cost 500 EUR , you can really find some affordable prices (starting from 130 euro, breakfast included), if you reserve well in advance and maybe even catch some promotion. 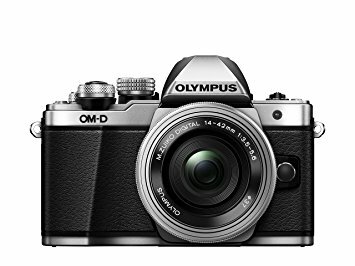 (Follow them on Facebook to know first about these kind of deals). Book your stay at the Three Sisters here! Luxury (US$ 300 and up): Cru Hotel: if you are a nostalgic and want to experience living in the XVth century, Cru Hotel, situated right in the heart of Talinn offers rooms decorated with style and elegance. Royal Residence Boutique Hotel & Spa: being situated at a walking distance from all the major tourist attractions in Talinn, guests can explore the city at will from here. Middle (US$ 100 – 150): Hotel St. Barbara is just a few minutes away from the city center and its restaurant and reception will offer the experience of being in a castle. Taanillina Hotel is a beautiful building that gives you the feeling of living in the 19th century because of the wood used to design the interiors. Budget (up to US$100): Oru Hotel is perfect for those who want a beach experience as it is situated in the near proximity. Guests have reviewed its staff as friendly. 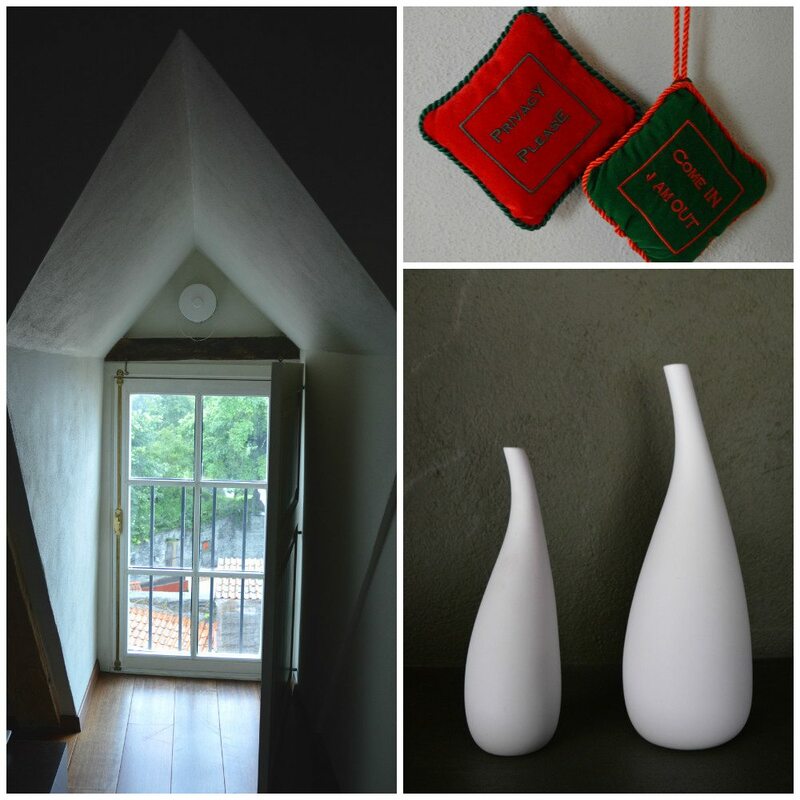 Hotel 777 is a quiet and comfy location with nice decorations and it is perfect for a retreat from the big city. While there are many great places to eat, I will name them all below, D.O.M restaurant deserves a little description! 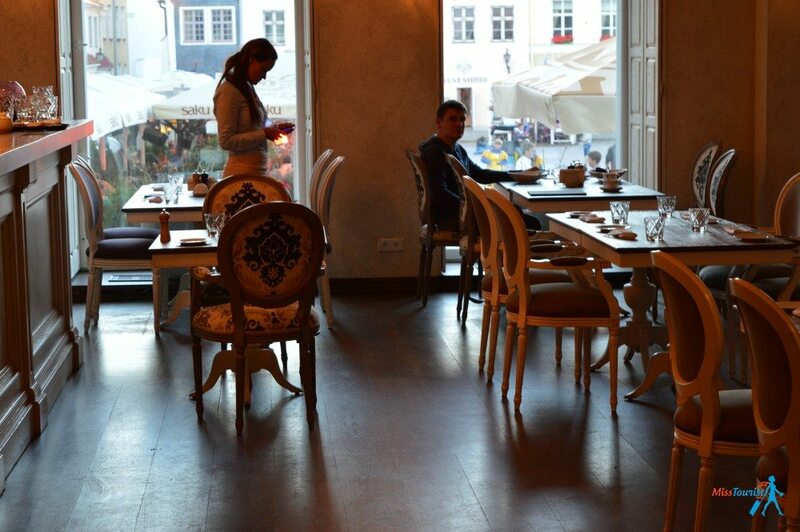 As we have already started with gourmet cuisine, there is a great high cuisine place right in the city center! The menu is quite unique, very modern yet truly authentic. I would call D.O.M restaurant an attraction for all you foodies out there. Again, the prices are a bit higher comparing to the neighboring restaurants on the square, but not to the rest of Europe, and the quality of the food and the service could not be compared! If you want to avoid the tourist crowd and eat where all locals eat go to Kalamaja neighborhood (just 15 minutes walking from the Old Twon). Kalamaja was originally a fish village, and now is a very hipster area with cool vibes. Many great an inexpensive cafes around there, I have eaten in Boheem and can definitely recommend it! Live music – best pubs in the Old Town: Chicago 1933, Clazz. If you want to reach Tallinn from any of the neighboring countries – it is very easy! From Saint Petersburg – the buses are frequent and cheap, I bought mine last minute and it was just 15€. Alternatively, you can take a plane, prices vary. From Riga – also, the best way would be to go with a bus. There are numerous buses that take this route: Lux Express, Ecolines, Simple Express. Eurolines do not go to Estonia. It is called E-stonia for a reason, right? This baby country has the biggest amount of start-ups per person in the world! Entrepreneurship spirit is generally very welcome in here! You want to register a company? Bam! You can do it online, no bureaucracy needed! Even the parliament can have online sessions! Estonians even released the first e-citizenship program. Yes, you can be an Estonian citizen and make your business there, charge your clients pay your taxes online from your remote location. People mostly use online payments. They are thinking of completely eliminating cash in the country, you can pay by card in every singly kiosk, so what is the need of coins in anyway? Can you imagine? I hope at some point every country will implement that. They replied, that they are generally happy of how the things are going in Estonia, the only big issue is doctors. If you want to schedule a (non-emergency) appointment with a doctor (online, duh! ), you will have to wait for about 2-3 months! Just to go to a general practitioner, 3 months, wow! The reason for this is the shortage of doctors. All of the doctors tend to leave to neighboring Scandinavian countries where they receive a much higher salary. I don’t blame them, the salaries in Norway for instance are enormous, but this seems to be a major issue, the only one they could find. Otherwise the country is clean, working and developed. And very inexpensive I would add! Why are there so many Russian speaking people there and how do they get along with Estonians? As I am Russian, I was very interested in the question and made a small research. Many Estonians speak Russian for historical reasons. Estonia was occupied by the Soviet Union in 1940 till 1991 (with a small period when it was retaken by the Hitler’s Germany between 1941 and 1944). No wonder many of them speak Russian, I was impressed! At some point I stopped trying English and just switched to Russian. Everyone I talked to understood me. And it is not like they would speak it just to talk to me, I heard many locals chatting in between themselves in Russian. Statistics says, that about 30% of the Estonian population actually belong to Russian community. FUN FACT: In Russia, we make fun of the Estonian accent as being very slow. Actually, Estonians speak at the same pace as Italians (read – super fast)! 🙂 I guess all the jokes are coming from the Estonians who actually speak Russian, and when they do, they make pauses, which is understandable. 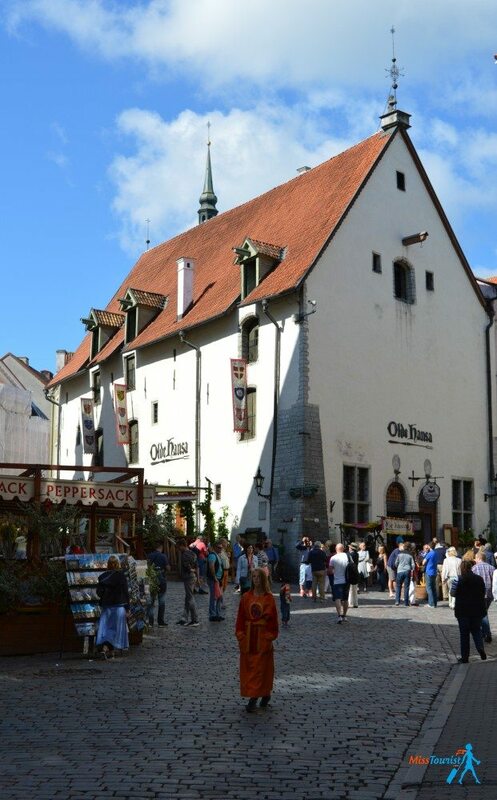 This medieval tiny city is amazing, it has a lot of things to discover, I have briefly described the TOP 5 places in Tallinn you absolutely should not miss! But you should come yourself and experience the inner charm of the city seldom found anywhere else! I also had a chance to stay in one of the most unusual hotels I have ever stayed, this 5 star hotel is called The Three Sisters and now a UNESCO World Heritage! 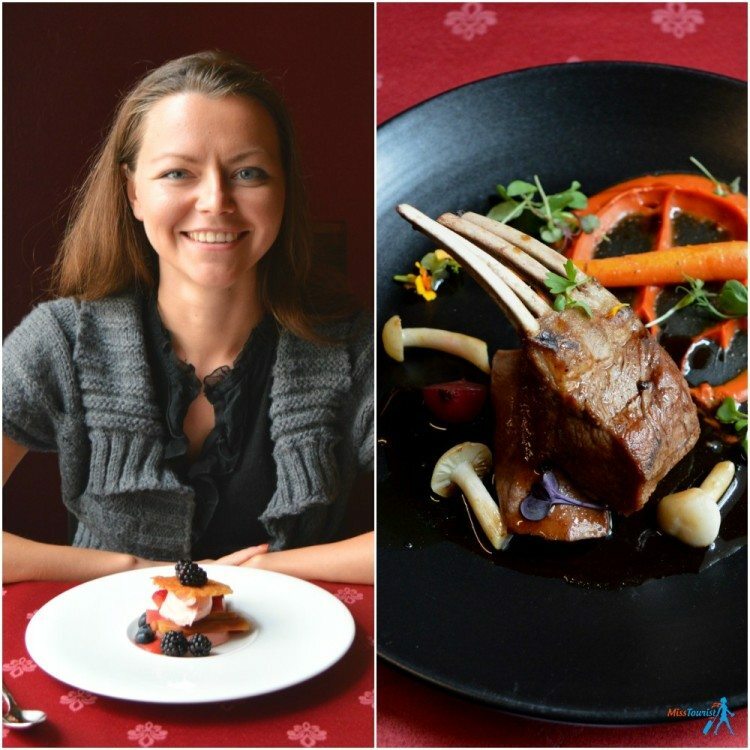 The food in Tallinn is amazing and inexpensive, I have included a list of great restaurants recommended to me by my local friends above. Enjoy it! As bonus, I told you about all the things I was curious about Estonia. The perks of this e-country and the relationship with Russia. You reached the end! Thank you so much for reading my article! P.S. Miss Tourist was welcomed in Three sisters hotel as a guest. My opinions are, as always, my own. 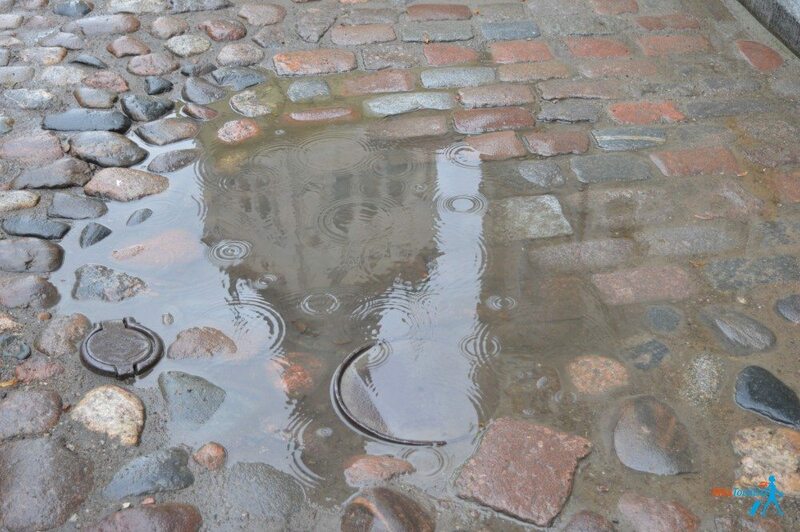 Have you been to Tallinn already, was your impression of the city similar to mine? 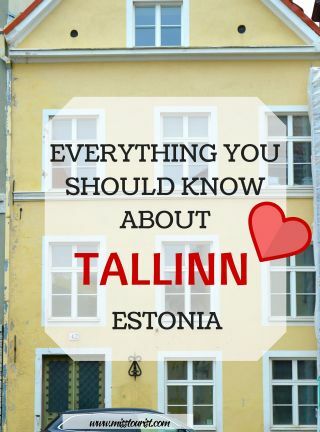 Do you have any questions about Estonia or Tallinn? Just drop a line in comments section, I will be glad to reply all your questions! Thank you for reading this article, if you like it, please share! But I would advice you to take a trip to Norway and the coast of Helgeland, and visit some of the islands such as: Dønna, Lovund, Nordnesøy and Rødøya. Wow that sounds like a good trip to Taliinn. I also find it cool that you can have breakfast in a UNESCO world heritage. It doesn’t happen often. I have really heard such great things about Tallinn and your article tells me so much more and really makes me want to visit. We all love history in our family, so I know the museum would appeal. I’d really, really love to just walk around the old town. To be honest I knew nothing about Tallinn or Estonia for that matter but your post has sparked my curiosity! I love all the detail and will have to look at this again if I ever make it there. To be honest, me neither, but this tiny country has a lot to say and to show! Thanks for the information. 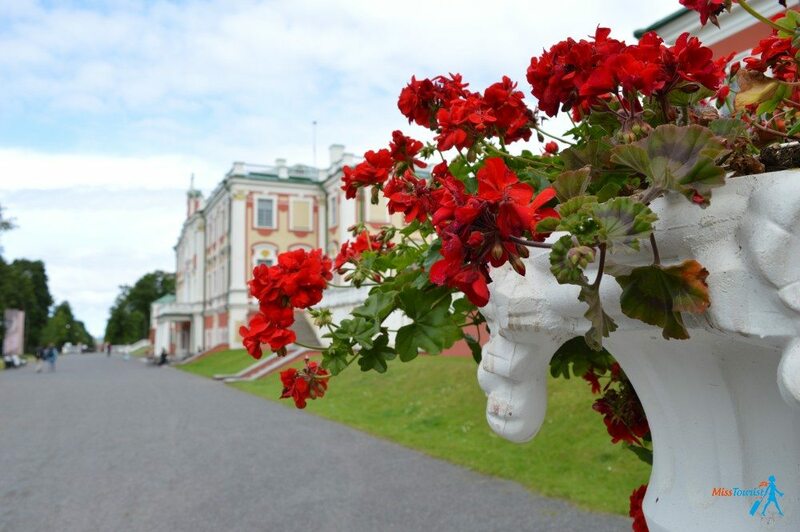 I’ll be in Estonia next summer–will put Kadroing Palace and Park on my itinerary. Yes, that is a must! Dont forget about the museums I am talking about. I think at least the Sea Plane harbor is definitely worth visiting! That hotel looks amazing! I’ve always been curious as to what Estonia is like-great post! thanks! The old town and the history museum look like great places to explore! Thanks for also sharing a bit about the county, its people, and the history. I’d love to visit! I visited Latvia last year and longed to stop in Estonia even if it was just for a day. Unfortunately, I didn’t go. Thanks for the reminder that it needs to go on my list. Such beauty around every corner. Loved your post and hearing about things in Tallinn I haven’t yet experienced. I visited last spring and simply loved Estonia! It was the biggest surprise I think I’ve ever experienced and now I want to add all the Baltic countries. I must admit that I know almost nothing about Tallinn, but it looks beautiful. Definitely somewhere I would like to check out. You were so lucky to stay in the three sisters, we tried but it was fully booked. We still had a wonderful time in and around Tallinn, a beautiful part of the world. Hey Tom, I am glad you liked it! Practical comments ! I loved the insights, thank you! This was very complete and helpful! I’m going there really soon, a trip around the balkan countries & finland! We are visiting Tallin on a Baltic Cruise in May 2017. I have found your review very interesting and have noted down many of your recommendations. I absolutely love your article about Tallinn! We’ll go there in march and I think I’ll definitely try the one or other activity you mentioned. We are two foodies, so I wanted to ask you if you know some traditional dishes that are worth trying? 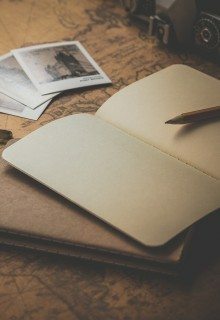 Have fun with your travels and thanks for this awesome article! 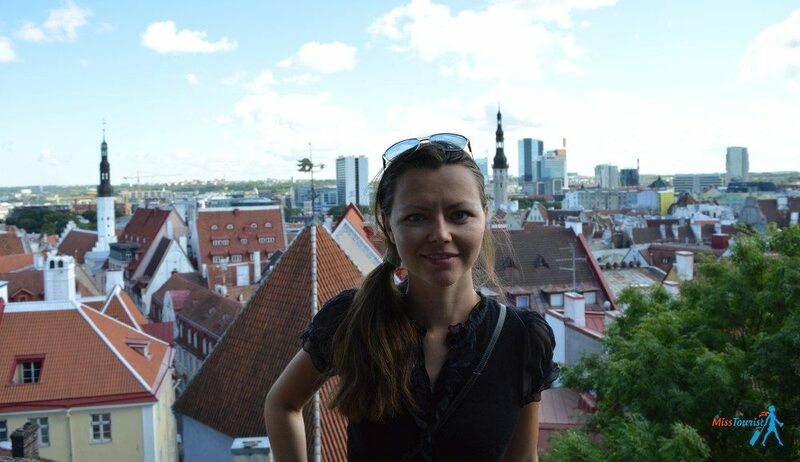 I am super excited about visiting Tallin after reading this article. Can’t wait to see it all! Great information. Thank you for your blog post. I will be heading there in a couple weeks. OW great information about Estonia. I will get admission n Estonian Entrepreneurship of Applied science.Hope i will get there and will eyecathing sight . I am planning a trip to Tallinn and this helped me a lot! Thanks so much!!! Going to Tallinn in June with my sister and her son 7 and my daughter 8 and son 2 while my husband is there on business. My husband will be busy most the time what would you suggest with us with our children? What language is spoken the most? Does anyone speak or understand English? Any English type food? The best description and advice about Tallin I ever read! I am eager for the end of the month when I will be in Tallin for the first time and you gave out precious information. Thanks alot! Thats so nice to hear! Have a great time there! 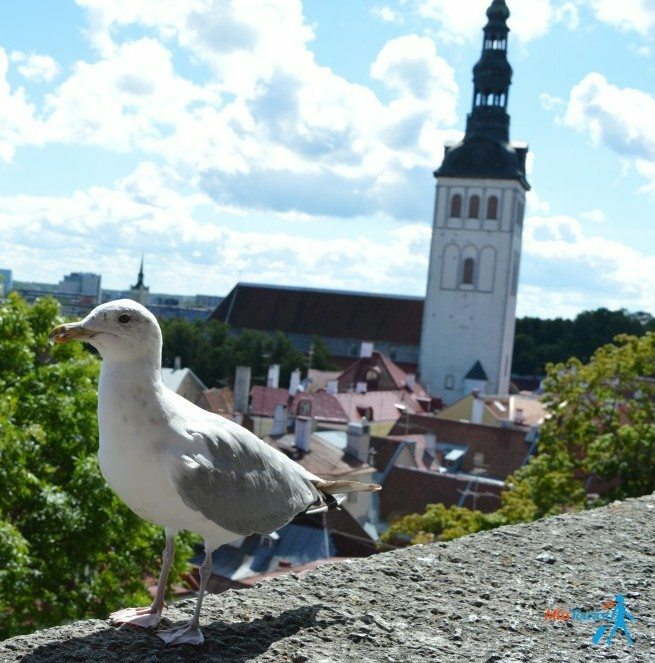 Tallinn was one of our stop on the Baltic cruise and we fell in love with it! Want to go again this August. Will be in Talinn for a week but can you suggest what we can do for another 5 days after that? depending on whether you want to go abroad or continue inside the country I can suggest either Helsinki either checking some cool places in Estonia. I havent been everywhere there, but Parnu I remember was really nice!